There has been an incident at my house. The equilibrium of our middle class lives has been shattered. My mum has sprained her ankle. It is the biggest news of the year. The ground troops have been called in for back up, i.e. me. My first good turn (a brownie guide must do three good turns everyday) as substitute woman of the house was to cook everyone dinner. Sound easy, not so. My dad had been instructed to buy Salmon, easy dinner she thought. My first thought was salmon tacos with guacamole, roasted peppers and rice. My dad doesn’t really like Mexican. 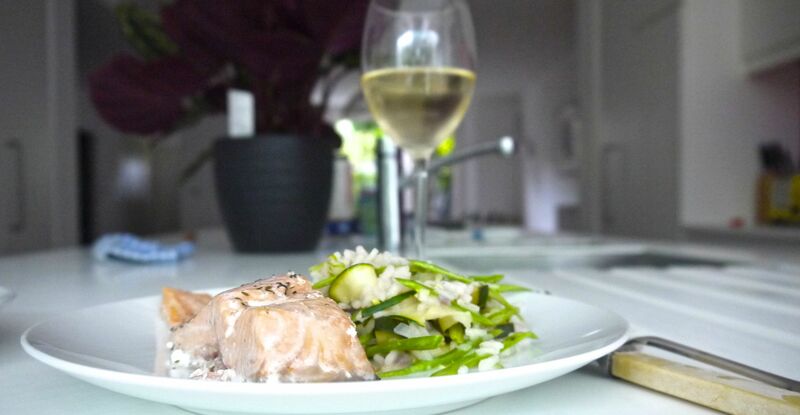 So then maybe a nice warm salmon salad with grilled courgette. He doesn’t really like salad either. Basically give my dad an overcooked pork chop with overcooked veggies and boiled potatoes and he will be happy, he’s old-fashioned that way. The recipe I came up with is traditional with a twist. It was completely made up but I think it works. It is not the cheapest dish in the world but for entertaining or pleasing fussy parents it is perfect. 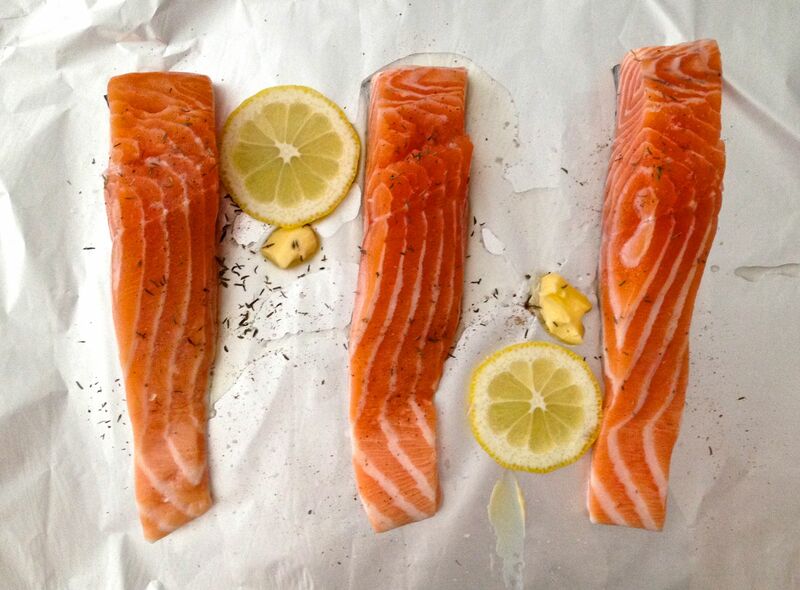 By far the easiest way to cook salmon, or any fish in fact, is in a tinfoil parcel, in the oven. You don’t get the crispy skin that frying would give but on the other hand the fish will not dry out, it stays lovely and flakey. If this recipe looks a little complex/ pricey for you you could equally make the risotto on it own but I would add a little grated parmesan and perhaps some int to give it more depth of flavour. 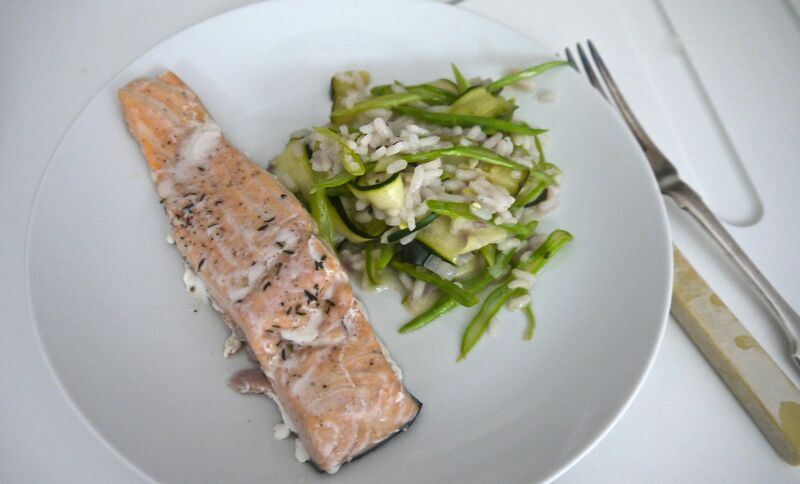 You could also save money by using less salmon and at the last minute, just before adding the veggies, stirring it into the risotto. This is a bit less fancy but equally delicious!